Currently there are no upcoming webcast events. Archived events are listed below. Identify various factors like restorative material, tooth preparation, isolation etc. that influence cement selection. Explain different techniques for cementation and bonding. Discuss the types of products that can be used to efficiently and effectively cement and bond modern restorations. This course will briefly explore the history and process for placing indirect restorations, including procedural details and common pitfalls. Dr. Fleming is an experienced dentist who has placed many indirect restorations in his 34 years of practicing dentistry. He has seen dental materials and technologies evolve, and will present a new method for creating a strong, fast, simple restoration. Have you experienced the frustrations of anesthetic latency and the residual effect that it has on your practice schedule? Do late patient arrivals cause disruptions to the practice flow? Now you can overcome these challenges with a revolutionary chair side technology that allows you to buffer your anesthetics! This presentation will begin with Dr. Falkel reviewing the science of local anesthesia including: the time course of analgesia, the factors that contribute to inconsistent anesthetic performance and how the body must overcome the acidity of local anesthetic injections before the anesthetic can take effect. Dr. Hyman will then discuss the benefits that buffered anesthetic provides for the practice’s activities and workflow, and will explain how to better-set expectations around success. Dr. Hyman will also discuss meaningful steps the dentist and staff can take when buffering is incorporated into the anesthesia routine, to enhance practice productivity and assist in better control of the schedule. This presentation will cover the specific value of CBCT in the diagnosis of Atypical Pain (burning mouth), Eagles Syndrome, monitoring of osteoarthritic healing of the TMJ, and the value in triage of treatment for Obstructive Sleep Apnea. As an international lecturer and researcher, Dr. Olmos has developed courses teaching his protocols for the identification, diagnosis and treatment of TMD, Craniofacial Pain and SleepDisordered Breathing. He regularly teaches these courses in Canada, Australia and the U.S. His protocols are also utilized in the Craniofacial Pain Center at the University of Tennessee College of Dentistry. Today, people are living longer and want to look their best! Cosmetic dentistry isn't limited to performing whitening, veneers or orthodontics. Tap into a hidden patient population who are seeking out the best in removable prosthodontics. Join Dr. John Nosti as he explains his steps to success in providing "Smile Designed Dentures". Through his process you will become faster, more predictable and increase profitability in removable prosthodontics, all while providing an outstanding cosmetic result. Dentures don't have to be dreadful... they should be fun!!! You know intuitively that your online reputation is important, but how do you manage it? Which 3rd party sites are the most important? How does social media and mobile play into this? Chris Brubaker, a small business marketing expert and Director of Marketing at Demandforce, will give you a practical guide on how to build your best possible reputation and teach you how to leverage your practice’s assets to bring in the right type of new patients. Chris will share the latest research and best practices in this information-packed 60 minute webinar. Digital restorative dentistry makes all the difference; in your treatment, office capabilities, office efficiency, bottom line and professional satisfaction. ‘Leap’ Into Digital Dentistry will be presented by Difference Makers, Drs. Jansen and Pescatore, and CAD CAM Dental Designer Ms. Irma Perez. Drs Jansen and Pescatore will demonstrate through their clinical expertise and experience how every office can benefit from chairside restorative dentistry and more importantly have complete control of comprehensive care, including restoratively-driven implant therapy and the latest technology. CE WEBCAST: Your Adhesive Technique - Simplified! Join Dr. Jeff Blank as he explores the broad category of dental adhesives. Learn how to simplify your adhesive technique as he discusses self- and total-etch procedures and discover a new class of adhesive from 3M ESPE, Scotchbond Universal Adhesive. Now more than ever, it is important to grow your practice with services that attract new patients and deepen your relationships with existing patients. As part of our commitment to the dental community, Align Technology, Inc. is proud to offer this unique webinar to help practices like yours thrive in this competitive marketplace. Learn from a successful wet-fingered dentist, Dr. Payam Ataii, as he unlocks the secrets you need to increase practice productivity. He is renowned for his innovative approach to the business and clinical sides of dentistry while running a multi-million private dental practice in Laguna Hills, CA. CE WEBCAST: Removable Prosthetics, Capture The Opportunity! Today, people are living longer…they want to look and feel good! This is your opportunity to take care of patients needing complete and partial dentures. Stop sending these cases out the door. Join Dr. Frank Lauciello, Director of Removable Prosthodontics for Ivoclar Vivadent as he explains 4 simple steps for success with denture placement. By utilizing his theories and techniques you can increase your bottom line and provide a standard of care that will really make a difference. Google Reviews, Facebook, email, Twitter, texting - these are all part of today's communications matrix but how can you use these and other cyber tools to grow your practice? This free webinar will help you navigate the world of e-communication and social media and show you how to use it to your advantage. In this webinar, we will explore an in depth clinical case review of Cone Beam 3D imaging. The more we see, the more we know, and the fewer mistakes we make. Better and more information for diagnostic and treatment-planning sessions, leads to fewer mistakes. We build stronger relationships with patients than ever before. The i-CAT® allows me to control all of the variables of the image, from the field of view to exposure time, pixel size and resolution. 3D puts the power of precision in your hands with direct access to advanced 3D treatment tools for Orthodontics. Join us for this in depth orthodontic clinical case review session. The townies have cast their votes selecting Demandforce D3 as the #1 marketing solution for dentists! Get an inside look into the automated communications and marketing system that has helped thousands of practices revolutionize their marketing tactics. Using real-world examples, we will explore how practices are embracing online communications, local search, and social networks to create brand awareness and increase revenue. During this technique-centered webinar, Dr. Olitsky will showcase posterior composite placement as well as diastema closure and direct anterior bonding involving multiple teeth. He will share his secrets to making composite materials blend invisibly with surrounding dentition, discuss application techniques and solve post-operative sensitivity issues. This timely webinar, sponsored by Easy Dental, is a detailed presentation focusing on the real-world impact of dental practice management software. Join us Thursday, March 10th 2011 to explore five time-tested ways to boost your revenue using practice management software. Large group practice continues to be one of the fastest growing segments in the dental space. With the increasing burden of high student debt, an uncertain economic outlook, and the common pressures that exist in private practice, the opportunities that large group practices offer are becoming increasingly more attractive to dentists. Our survey team, consisting of third party academic, consulting, and industry experts outside of large group practice, researched many of the attributes of the large group practice. Join us to discuss the findings and best practices that have been observed through our study. This course promises to offer the attendee an in depth analysis of the qualitative and quantitative aspects of the rapidly expanding world of large group practice. 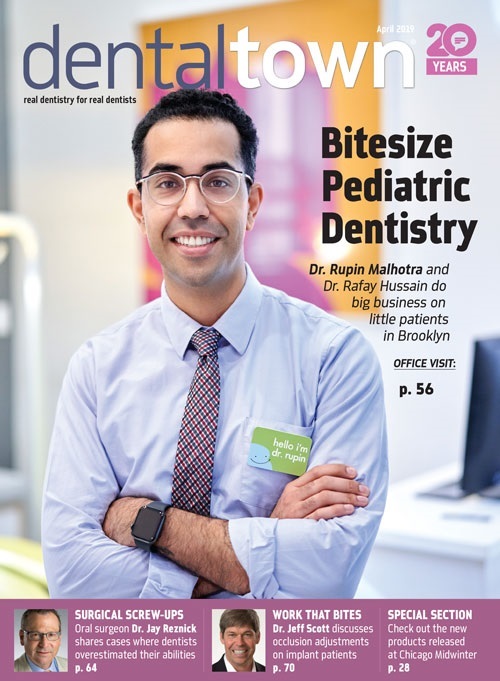 Learn just how far these practices have evolved over the past decade, their commitment to their dentists, and what the future looks like in this segment of dentistry. "Reinventing “Word-Of-Mouth” with Social Media"
Email was the first wave of web-based marketing. Then came the rise of Internet search. Now Social Media is changing everything, and your practice needs this hot new marketing tool to succeed today. Gone are the days of only having a website as an online presence. It has become increasingly important to communicate with the public through Social Media as well as monitor your online reputation. Comments and discussions about your practice are happening online regardless of you being there or not. Whether you're completely new to Social Media or a seasoned pro, this webcast is not to be missed as we show you the tools you need to take control of your online presence. Join Dr. Edward D. Gardner Jr. as he shares how incorporating Invisalign into his busy practice has increased patient satisfaction, improved his practice economics and re-energized his entire team. Find out why Invisalign is a win-win prospect for patient, doctor and staff alike. This course features the clinical process, step by step, for expedited construction of complete dentures. Based on sound principles, these same clinical steps are followed for economy dentures and for premium dentures. Recommendations for delegation of simple lab procedures to office staff are provided as well as patient communication tips. From impressioning to recording of maxillo-mandibular relations, to verification of phonetics and esthetics and finally, delivery, this presentation simplifies the complete denture sequence for general dentists. Think You’ve Tried Everything to Get New Patients? Think Again! Discover the Secrets to Doubling Your New Patients in the Next 12 Months Guaranteed! During this interactive presentation, free to all who participate, Jay will walk you through, step-by-step how to increase your new patients by simply leveraging existing assets in your practice. You can do just about anything online these days – shopping, banking, trading stocks, making travel arrangements, etc. – so why not manage your practice the same way?! Join us on Thursday, November 12, as we present the next revolution in dental software!